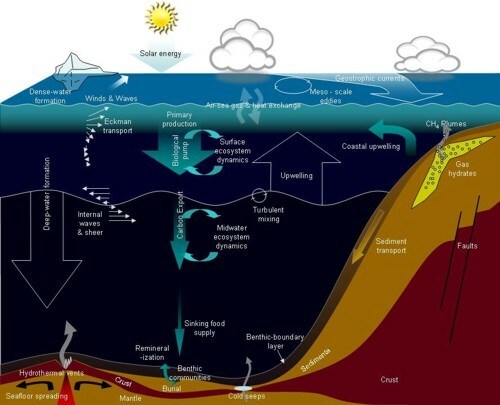 Illustration of major processes in the marine environment indicating the interconnectedness of atmospheric, surface ocean, biological pump, deep-sea and solid-Earth dynamics. This figure is based on other similar figures prepared by P. Cochonat, C. Berndt, the US Ocean Observatories Initiative, and ESONET NoE. Over the past three decades or so ocean scientists have identified and studied a wide range of processes ranging from the scale of tiny marine plankton to regional currents and fisheries, to global ocean circulation. In order to tackle the big socially important themes in marine science what’s needed are systems that can effectively look across those scales and between disciplines to better understand how changes in global circulation can, for example, influence production of tiny plankton. Measurements from ships and short-term studies have been helpful, but previous methods and research programme setups have not been able to capture the kind of information that we know is needed. The observatory approach is also vital because it allows researchers to confirm their instruments are working and report potential important interesting events or geohazards and in some cases alter the collection of data to monitor specific events in special way. The upper ocean and deep-sea are responsive to shifts in climate. In much the same way that your garden can be lush and green one year and a bit dreary the next, the ocean also experiences similar changes related to climate. As the planet is moving into what will likely be a very long-term shift in climate, widely attributed to human activity, a better understanding of ocean impacts and feedbacks to the climate system is needed. Understanding the value of ecosystem functions and services is also a focus of research. If one can understand the value of the oceanic carbon cycle, for example, making decisions about how to mange the ocean are more straightforward. The ocean stores a staggering amount of carbon and is absorbing about 1/3 of the carbon man is emitting into the atmosphere, so understanding the oceans ability to take up carbon into the future is critical to climate research. Progress is also needed in geohazard early warning. Most seismometers and tide gages around the world are on or very close to land, but the world is mostly covered by water nearly 4000 m deep. By relaying data back to shore in real-time, ocean observatories can provide feedback to better understand the causes of earthquakes and tsunamis, and issue warnings to governments about hazard events. How can monitoring of factors such as seismic activity, fluid pore chemistry and pressure, and gas-hydrate stability improve seismic, slope failure, and tsunami warning? To what extent do seabed processes influence ocean physics, biogeochemistry, and marine ecosystems? How are physical and biogeochemical processes that occur at differing spatial-temporal scales related? What aspects of physical oceanography, biogeochemical cycling, and ecosystem function will be most sensitive to climatic and anthropogenic change? Will there be important feedbacks of potential ecological change on biogeochemical cycling and ecosystem function which require policy intervention to avoid costly outcomes? What are the factors that control the distribution and abundance of marine life and what will the influence of anthropogenic change be?